Mr. Trent West has developed a line of Tungsten Carbide-based jewelry rings which he commercially sells in connection with several different tradenames. In connection with his technical developments, Mr. West has sought state and federal intellectual property protection for his efforts. In particular, Mr. West has obtained federal trademark registration for his TREW TUNGSTEN® and PERMANENTLY POLISHED® mark, which are used in connection with all the tungsten-carbide jewelry rings. With respect to patent protection, Mr. West now has seven issued patents, U.S. Patent Nos. (1) 6,062,045; (2) 6,553,667; (3) 6,928,734; (4) 6,990,736; (5) 6,993,842; (6) 7,032,314; and (7) 7,076,972. Two are directed to finger rings that cover a significant portion of the TREW TUNGSTEN® ring line, while the other five protect methods of making jewelry rings and finger rings related to the product line. Mr. West also presently has two recently filed U.S. patent applications pending at the U.S. Patent & Trademark Office ("U.S. PTO"), one of which recites methods of preparing annular jewelry rings. The other of these two applications recites tungsten carbide-based jewelry rings. 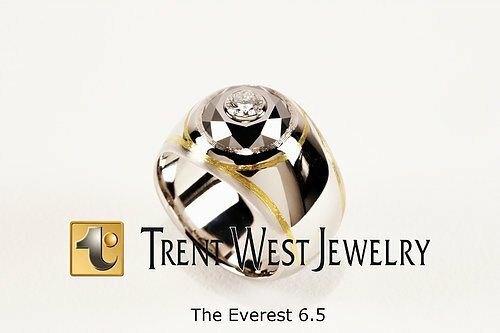 The issued and pending claims cover various tungsten carbide-based jewelry and finger ring products, and methods of manufacturing the same, as commercialized by Mr. West through Trent West Design, Inc.
Mr. West has two trademarks typically used in connection with sales of his Tungsten Carbide based jewelry rings. These are noted below. TREWTUNGSTEN® and PERMANENTLY POLISHED® both are federally registered U.S. Trademarks. Mr. West individually owns all rights to these marks at present. Mr. West, as the sole listed inventor on each patent, individually owns rights to each of the patents and patent applications noted below. Mr. West has seven issued patents, as well as a series of two additional pending U.S. patent applications, described below. U.S. Patent No. 6,928,734 is generally directed to methods of providing a Tungsten Carbide based annular jewelry article having a desired surface profile and including an annular band by providing a mixture of two or more powdered materials of at least 50 weight percent to less than 85 weight percent Tungsten Carbide to form the annular band into a pressure mold, compressing the powdered material mixture at a pressure sufficient to form an annular blank, and sintering the annular blank at a temperature sufficient to form the Tungsten Carbide based annular jewelry article so as to be long wearing and virtually indestructible during normal use thereof. In one claimed embodiment, the powdered materials consist essentially of at least 50 weight percent Tungsten Carbide. U.S. Patent No. 6,062,045 is generally directed to finger rings comprising an annular body made of material selected from the group consisting of sintered metals and ceramics, where the annular body has two inner and two outer frusto-conically shaped facets and a cylindrically shaped facet having an outer diameter and at least one annular groove formed therein with a precious metal disposed within said groove, an outer surface of said precious metal lying within the outer diameter of the cylindrically shaped facet to protect the precious metal from wear. The rings are ground and polished to a mirror finish. U.S. Patent No. 6,553,667 is generally directed to methods of manufacturing composite articles including a ring-shaped single piece substrate having an outer surface and a depression comprising a groove disposed circumferentially in the substrate outer surface and comprising a first material and an inlay within the groove comprising a second material. In particular, the method comprises preheating the single piece ring shaped substrate, contacting the depression with the inlay second material in the form of a metal wire, heating the inlay second material proximate a point of contact with the substrate causing the second material to liquefy and flow into the depression, and moving the point of contact along the depression while continuously feeding and heating the metal wire while rotating the ring shaped substrate to move the point of contact along the groove and to at least partially fill the groove with the liquefied metal wire. U.S. Patent No. 6,990,736 is generally directed to methods of making a jewelry article by providing an annular substrate formed of a hard material predominantly including tungsten carbide and having an outer surface with an outer diameter and a depression disposed circumferentially in its outer surface, providing a metal band having an inner diameter that is greater than the outer diameter of the annular substrate, and inwardly deforming the metal band to squeeze it into the depression. In other covered embodiments, purely by way of example, either (1) the hard material is sufficiently hard to avoid being deformed during the inward deforming of the metal band; or (2) the method further includes heating the metal band or brazing the metal band using a brazing material, or both, to assist in attaching the metal band to the annular substrate. U.S. Patent No. 6,993,842 encompasses claims directed to a method of providing a tungsten-carbide based annular jewelry article having a desired surface profile and including an annular ring that defines an aperture adapted and configured to receive a body part, by providing a mixture of two or more powdered materials including tungsten carbide material in a predominant amount sufficient to form the annular ring into a pressure mold having a cavity of predetermined annular configuration and sized formed therein, the size of the mold being greater than the final size of the annular ring, compressing the powdered material mixture at a pressure sufficient to form the annular ring into an annular blank which has the aperture adapted and configured to receive a body part, sintering the annular blank at a temperature sufficient to form the tungsten-carbide based annular ring so as to be long wearing and virtually indestructible during normal use thereof, providing at least one depression that extends into, and at least substantially around the circumference of, an outer surface of the annular ring, and introducing molten metal into at least a portion of the depression so that it will harden within the depression to provide the annular jewelry article. Other covered embodiments include, for example, pre-heating and forming rings of particular shapes. U.S. Patent No. 7,032,314 is generally directed to methods for making wear resistant jewelry rings from sinterable metal and/or ceramic powder materials compressed into a predetermined configuration and then sintered to form a blank from which a jewelry item may be made and to which softer precious metals, stones, crystals or other materials suitable for use in jewelry may be affixed. Such items of jewelry may have multiple facets and can be fabricated using various disclosed techniques and various combinations of materials. U.S. Patent No. 7,076,972 is generally directed to wear resistant finger rings including comprising an annular body made of a sintered hard material comprising a predominantly tungsten carbide material, wherein the annular body has one or more external surfaces that are continuous and of a width sufficient to provide each external surface with a facet having a polished grey mirror finish and with the hard material being long wearing and virtually indestructible during normal use of the finger ring so that each facet retains its mirror finish, wherein each facet extends concentrically and continuously around the circumference of the ring without variations in its width, and wherein the body includes a cavity of a predetermined size and shape that is a continuous slot which extends entirely around the annular body and is configured to receive an insert of a decoration component of a precious metal that provides a substantially different visual effect to the ring. There are presently two pending applications at the U.S. Patent & Trademark Office. The claims of these pending applications are directed to pursuing additional jewelry ring and method of manufacturing embodiments of Mr. West's inventions and, if allowed, will permit unauthorized competitors even fewer opportunities for legally making or selling predominantly tungsten-carbide jewelry rings.